Kaminski Auctions’ August Estate auction saw two days of strong sales and prices for everything from Regency furniture to European portraits. The top lot of the sale held on Saturday, and Sunday, August 18th and 19th, was a Julian Onderdonk, oil on wood painting titled 'Grey Morning' from a Palm Beach, Florida estate. Onderdonk who died at age forty was an impressionist painter from Texas who studied under William Merritt Chase and is known “as the father of Texas painting.” The small painting measured five inches by nine inches and sold for $19,200. 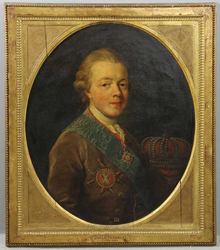 Two Russian portraits of Emperor Paul Petrowitz, son of Empress Catherine the Great and his wife Empress Maria Feodorovna (1759-1828) sold for $14,400 each. The oil portraits were purchased originally by a dealer in Paris in 1915 and later bought from Helen Schachter Antiques, 43 West 64th St, New York, New York in the 1970’s. A circa 1983 painting titled 'Lobstaland', oil on linen, by the contemporary artist Andrew Stevovich sold for $8,250. Stevovich, a Rhode Island School of Design graduate is represented by the Adelson Galleries in Boston and New York and his paintings are in the collections of Boston Museum of Fine Arts, the DeCordova Museum and the Danforth Museum to name a few. Known as a figurative painter the painting is a contemporary depiction of a family with lobster bibs. Other exciting paintings that brought good prices included an18th century English portrait of a young boy with a dog, titled 'Blue Boy' that fetched $5,100 and an Aldro Hibbard, winter in Vermont scene, oil on canvas board that brought $3120. A collection of Brian Coole paintings from a Charlestown, Massachusetts collector brought prices in the $3,500-$5,000 range which included scenes of the Boston State House, 'The Burning of Charlestown – The Attack on Bunker Hill’ and ‘Taking The Flag.’ Also, from the Charlestown, Massachusetts collection was a polychrome paint-decorated leather fire bucket dated 1807, with an eagle banner of 'Ancien- Fire Society', 'Ol-is & Sargent' and 'Charlestown' written on the side. With its original handle, the fire bucket stood twelve and a quarter inches high and sold for $3,360. A strong collection of Regency furniture from a Palm Beach estate brought spirited bidding competition. Most of the antiques were quality pieces purchased from such well-known antique dealers as Florian Papp, NYC, New York, Agostino Antiques, NYC, The Graham Gallery, London and Taylor B Williams Antiques, Chicago IL. A set of eight Regency rosewood and brass dining chairs with beaded brass banding and a spirally fluted back splat, caned seats and sabre legs sold for $9,000, while a Regency library table featuring fine brass inlay, applied decoration, and original leather top sold for $8,400. A Regency satinwood revolving circular bookcase sold for $3480 while a large antique Adam oval form cellarette with a gilt gadrooned edge over a finely etched classical urn and with gilded lion mask handles sold for $3,360. Continental furniture highlights included a pair of 18th century Louis XV giltwood console tables each with serpentine form rosso antico marble tops from the Guy Regal Gallery, 53rd St, New York, NY that sold for $9,000. A Steinway black ebonized Model A salon grand piano from the former home of Andrew Carnegie II, Manchester-by-the-Sea, Massachusetts sold for $4,800, while a Steinway black ebonized Model B concert grand piano, circa 1889 from a Palm Beach, Florida estate brought $8,400. Asian porcelain in the auction brought good prices with a rare yellow enamel Famille Rose vase achieving $3,125 and a rare Celadon gilt decorated vase fetching $2,640. Other items of interest included a signed Steuben engraved glass sculpture, 'David and Goliath', designed by Don Weir and introduced in 1959. The glass sculpture was set in a conforming wooden base and measures ten inches and brought $4,500, while an unusual KPM porcelain plaque featuring a portrait of Rembrandt's father, in its original giltwood sold for $5,700. Jewelry highlights included an Edwardian diamond and pearl pendant, set in platinum, with silver chain from the Helen Schachter Estate, New York, New York that sold for $8,400.